Ribbons and laces to decorate your scrapbooking and card making projects, for gift wrapping and more. Product Description: Ribbon with a design of matrioskas in bright blue over a background in dark red.Width: approx. 15 mm.Content: The price shown is per 1 meter of ribbon.Composition: Synthetic textile and dyes. The manufacturer recommends not to iron directly over the ribbon.Designer: Luzia Pimpinella, 2008 . All rights reserved. Product Description: Ribbon with a design of a Dachshund dog and decorated with sausages strings over an orange background.Width: approx. 15 mm.Content: The price shown is per 1 meter of ribbon.Composition: Synthetic textile and dyes. The manufacturer recommends not to iron directly over the ribbon.Designer: mymaki, 2011. All rights reserved. Product Description: Cotton ribbon with red tulips.Manufactured by: Sajou.Dimensions: 1 m long and 6 cm wide.The ribbon is presented on a Sajou ribbon card in hard cardboard. These tapes are made in Germany by expert hands, in factories dating back almost a century and are re-editions of old models. Product Description: Cotton ribbon with leaves in different shades of red.Manufactured by: Sajou.Dimensions: 1 m long and 30 mm wide.The ribbon is presented on a Sajou ribbon card in hard cardboard. These ribbons are made in Germany by expert workers in factories dating back almost a century and are re-editions of old models. 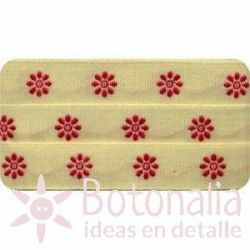 Product Description: Cotton ribbon with red flowers.Manufactured by: Sajou.Dimensions: 1 m long and 15 mm wide.The ribbon is presented on a Sajou ribbon card in hard cardboard. These ribbons are made in Germany by expert workers in factories dating back almost a century and are re-editions of old models. Product Description: Cotton ribbon with red flowers.Manufactured by: Sajou.Dimensions: 1 m long and 21 mm wide.The ribbon is presented on a Sajou ribbon card in hard cardboard. These ribbons are made in Germany by expert workers in factories dating back almost a century and are re-editions of old models. Product Description: Cotton ribbon with red flowers.Manufactured by: Sajou.Dimensions: 1 m long and 10 mm wide.The ribbon is presented on a Sajou ribbon card in hard cardboard. These ribbons are made in Germany by expert workers in factories dating back almost a century and are re-editions of old models. Product Description: Cotton ribbon with red designs.Manufactured by: Sajou.Dimensions: 1 m long and 10 mm wide.The ribbon is presented on a Sajou ribbon card in hard cardboard. These ribbons are made in Germany by expert workers in factories dating back almost a century and are re-editions of old models. Product Description: Cotton ribbon with red motifs.Manufactured by: Sajou.Dimensions: 1 m long and 11 mm wide.The ribbon is presented on a Sajou ribbon card in hard cardboard. These ribbons are made in Germany by expert workers in factories dating back almost a century and are re-editions of old models. Product Description: Cotton ribbon with red motifs.Manufactured by: Sajou.Dimensions: 1 m long and 10 mm wide.The ribbon is presented on a Sajou ribbon card in hard cardboard. These ribbons are made in Germany by expert workers in factories dating back almost a century and are re-editions of old models.